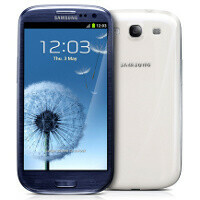 The Samsung Galaxy S III is not only the most powerful smartphone on the market - it’s also launching on all major carriers in the United States and across the globe. It’s been available internationally since May, but it will really get a huge sales boost this month when it hits the US. And analysts from JP Morgan now say the Galaxy S III sold in 6.5 million units in the month or so of its availability in the second quarter of the year, and is expected to sell another 15 million units in Q3 2012 alone. Combined, this means over 21.5 million S IIIs sold in just a few months and that’s iPhone-like popularity, if it comes true. Moreover, in the three months from March to June, Samsung is estimated to have sold around 50 million smartphones, blowing the 30 million estimate for iPhone sales out of the water. That’s a huge success for the Korean company that is now the world’s largest phone and smartphone maker. Samsung also made the Galaxy Nexus, which is just unbeatable value for the money at the $350 off contract price on Google Play. The Nexus is also the first and only phone so far to get the Android 4.1 Jelly Bean update. will it beat the s2's record? You bet. Definitely.. I expect Galaxy S3 to surpass 30+million Galaxy S2 sales in just 3 quarters..
and the sale of this SGS III will go on even after the release of SGS iV. It will.. and that's for sure. But damn, the galaxy note 2 is more exciting than gs3. at least for me..
you misinterpret the findings. the 2nd quarter ended may31st. That 9 million preorder was world wide. These numbers here do not include a single US SGS3 sale, just international. The US is the largest market for samsung by far. The numbers will reflect that in the Q3 sales. Launching on the top 5 US carriers almost simultaneously is huge, even Apple hasn't managed to pull that one off. TouchWiz. Ew. They need to cut it out and make it a pure Google phone. Or, make it user selectable in settings. But, the way they've been selling, Samsung has no incentive to drop TouchWIZ. I don't think it will ever happen. Like it or not, Touchwiz is getting better in terms of visual look, just some minor iteration needed like changing cartoony icons, changing the color green battery bar & notification toggle buttons into white or cyan color and putting the app drawer button in the center, and the ugly weather widget too, then you will have a decent Touchwiz.. I actually like Touchwiz to a point. Some of the features it has/adds aren't bad, I just wish I had more control over little things. Like you mentioned, app drawer button in middle (but why not just allow us to put it anywhere, like a normal icon?) Notification toggles are so amazing, but ability to change size, rearrange order, add or remove your own would be so much more useful, and doesn't seem like it would be that hard to implement. Only real problem I have with any interface really, is the inability to customize it to what you want without having to download different launchers etc. Why not be fully customizable out of the box? Ok, just went over custom launchers, I realize there are different app launchers, but still. full out of box customization would be nice. actually the latest TouchWiz is a much better UX compared to the previous one. For skins, I am a Sense fan, but I must say that Samsung did something wonderful with this version of TW.. But again, if you want to have Google experience, just root it, it has never been so hard to do so with Samsung phones. And it is easy to revert back , too..
We have to wait from Samsung to report the actual total S3 sold, now is just an estimated. About 20 million less potential customers of iPhone 5!! Keep that count going, go android! !